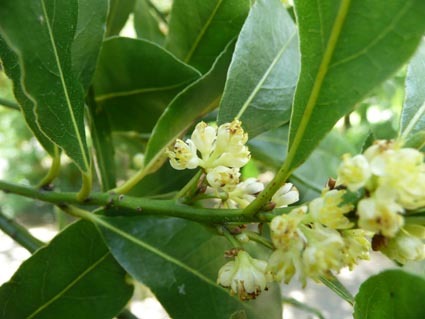 Sweet bay is the true laurel of antiquity, held in reverence by the Greeks and Romans, who used it to make wreaths of honour for emperors, generals and poets, hence the specific name nobilis. In Medieval times, learned men and graduates were crowned with wreaths of the evergreen bay leaves with berries, in Latin bacca (berries) laurus, from which comes the French baccalaureate and our word bachelor, used in designation of degrees, eg Bachelor of Science or Arts. In addition to its symbolism, bay was formerly valued for its medicinal properties (it is digestive, antiseptic, carminative and soothing to inflammation), but it is best known for its culinary uses. 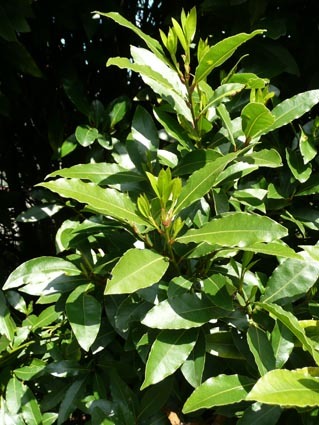 Leathery and aromatic, bay leaves are a staple herb, backbone of the bouquet garni and are used mostly in savoury dishes, but also in certain sweet dishes such as milk puddings. Bay, perhaps more often seen in modern gardens as topiary specimens such as standard mopheads or cones can in fact make a noble tree reaching 20 metres. In Belfast Botanic Gardens, we have a single-stemmed specimen, fifteen to twenty feet and growing near the upper glazed gable of the tropical ravine, and another possibly older specimen that shows signs of heavy pruning or perhaps cold damage in the past and is multistemmed. 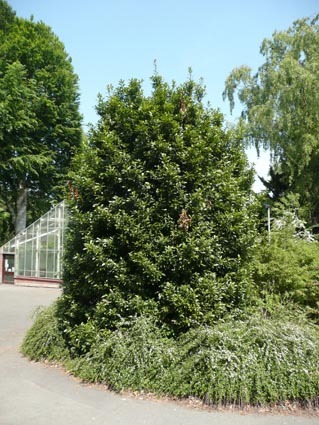 Neither specimen alas does more than hint at the possibilities of this handsome evergreen. 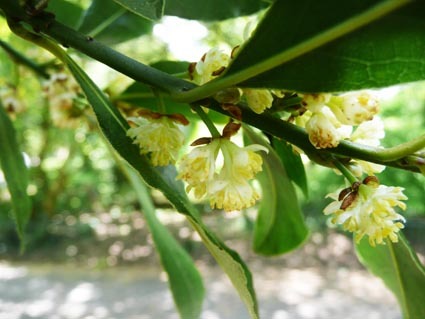 Laurus nobilis is a native of the Mediterranean region, is naturalised all over the world, and is reasonably hardy in this country (although the leaves can scorch in cold winds). It blossoms handsomely, a fact that is often overlooked, bearing small flowers, of a rich yellow cream colour, that are dioecious . These are followed in favourable conditions by black berries. Photos taken in Belfast Botanic Gardens in 2013. Copyright: Friends of Belfast Botanic Gardens.